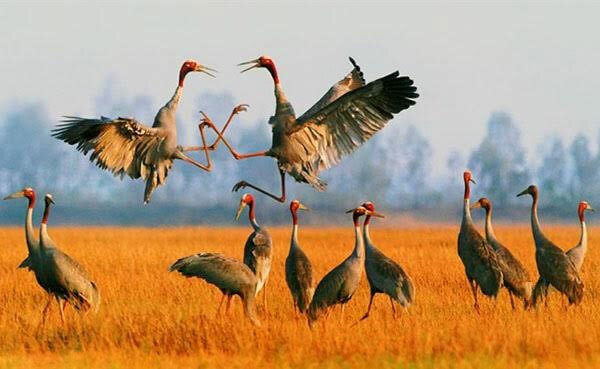 VietNamNet Bridge – A flock of 18 red-headed cranes has recently returned to Phu My Reserve in the Cuu Long (Mekong) Delta province of Kien Giang, according to Nguyen Phong Van, director of the reserve. A flock of 18 red-headed cranes has recently returned to Phu My Reserve in the Cuu Long (Mekong) Delta province of Kien Giang, according to Nguyen Phong Van, director of the reserve. Last Saturday (Feb 25), the red-headed cranes were spotted at the reserve, which contains bang (Lepironia articulata) grass in Giang Thanh District. From February to the end of March each year, dozens of red-headed cranes come to find food in Giang Thanh and Kien Luong districts. In recent years, the number of cranes returning to Kien Giang has declined steeply because of flooding caused by unseasonable rains. Phu My is the only bang grass ecosystem in the delta that is seasonal habitat for red-headed cranes. The reserve, established in early 2016, has a core area of 940ha and a belt area of 1,700ha.